CAUTION: Python and its Jython variant do not use braces, brackets, or parentheses to indicate program structure, but rather rely on formatting, specifically indentation. To avoid confusion, it is STRONGLY recommended that you DO NOT USE TABS but rather use spaces (four is typical) to show statements that part of a class or controlled structure where you might have used some bracketing. Most program editors have a setting to automatically changes tabs to a set number of spaces to make this easier. 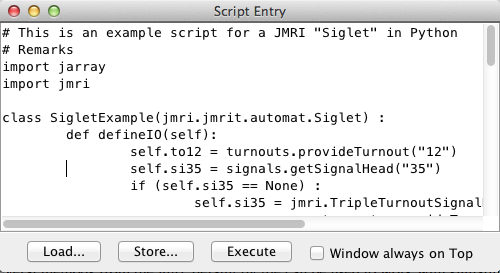 There are several ways to use Python scripts with JMRI. The easiest is to use the built-in support in the standard JMRI applications: PanelPro, DecoderPro, etc. From the "Panels" menu, select "Script Entry". This will give you a window where you can type one or more commands to execute. (Note that it might take a little while the first time you do this as the program finds its libraries; it will be faster the next time) The commands stay in the window, so you can edit them and rerun them until you like them. From the "Panels" menu, select "Script Output". This creates a window that shows the output from the script commands you issue. JMRI does not provide a full "development environment," but it does provide some basic information that can help with debugging your scripts. Open the JMRI System Console window (Help->System Console). This will give you instant information pertaining to WARN and ERROR messages. Text can be copied to a text editor for further review. Open the Script Output window (Panels->Script Output). This will display the results of any "print" statements in your script as well as some error messages (NOTE that some errors go here and some to the System Console so you you should have both windows open when you are debugging). Text can be copied to a text editor for further review. Investigate the information found in the technical reference to be better able to insert more of your own DEBUG and INFO messages into the session.log file, and also the JMRI System Console window. You might also investigate the "default.lcf" file that is described in that link. Note to Mac OS users: BBEdit and similar tools do some syntax checking. For PC users, Notepad++ is a good tool for getting indentation correct. Note that this is running a complete version of the JMRI application; all of the windows and menus are presented the same way, configuration is done by the preferences panel, etc. What the Jython connection adds is a command line from which you can directly manipulate things. This results in much easier-to-read code. There are a lot of useful Python books and online tutorials. For more information on the Jython language and it's relations with Java, the best reference is the Jython Essentials book published by O'Reilly. The jython.org web site is also very useful. Jython simplifies that by allowing us to provide useful variables, and by shortening certain method calls. Note that the variable t2 did not need to be declared. Note that Jython uses "1" to indicate true, and "0" to indicate false, so sensor 3 is currently active in this example. You can also use the symbols "True" and "False" respectively. This sends that three-byte packet four times, and then returns to the command line. Scripting would not be very interesting if you had to type the commands each time. So you can put scripts in a text file and execute them by selecting the "Run Script..." menu item, or by using the "Advanced Preferences" to run the script file when the program starts. Although the statements we showed above were so fast you couldn't see it, the rest of the program was waiting while you run these samples. This is not a problem for a couple statements, or for a script file that just does a bunch of things (perhaps setting a couple turnouts, etc) and quits. But you might want things to happen over a longer period, or perhaps even wait until something happens on the layout before some part of your script runs. For example, you might want to reverse a locomotive when some sensor indicates it's reached the end of the track. There are a couple of ways to do this. First, your script could define a "listener", and attach it to a particular sensor, turnout, etc. A listener is a small subroutine which gets called when whatever it's attached to has it's state change. For example, a listener subroutine attached to a particular turnout gets called when the turnout goes from thrown to closed, or from closed to thrown. The subroutine can then look around, decide what to do, and execute the necessary commands. When the subroutine returns, the rest of the program then continues until the listened-to object has it's state change again, when the process repeats. For more complicated things, where you really want your script code to be free-running within the program, you define a "class" that does what you want. In short form, this gives you a way to have independent code to run inside the program. But don't worry about this until you've got some more experience with scripting.